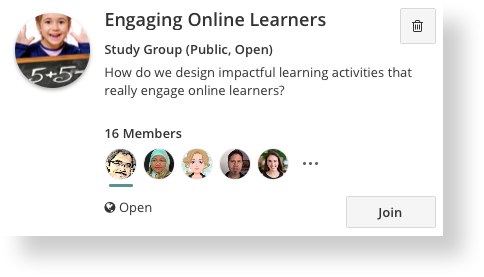 How do I use groups on OpenLearning? Note : This help page only reflects the group work system on courses created after June 2017. If you don't yet see groups laid out in this format in your course, don't worry! We're working on migrating all groups to the new style in the coming days. Meanwhile, refer to this guide for help with the prior version of group work. Study groups provide a space for students to discuss particular topics with like-minded classmates. Project groups provide a space for students to collaborate and build solutions together. Tutorials groups provide institutions with the structure they need to manage and support large numbers of students. These group types are highly customizable in order to cater to the needs of your course. How do students create groups? How does course admin set up group types? How do I set up group activities/submissions?